It was a sunny Saturday and a mob composed of children and adults clamored to gain entrance to the St. Helens High School gymnasium. Some had tickets in hand, others patiently waited for the ticket window to open. Finally the main doors opened and a joyful crowd surged inside. "Let's find a good seat…" "I want some pop corn and a candy bar…"
A man wearing a Kiwanis hat announced: "Don't worry, we have lots of good seats. You have plenty of time before the game. We have room for everyone both on the lower level and the balcony." Before people entered the gym proper, they were greeted to a silent auction and given an opportunity to bid on gift baskets or buy Plastic fire hats filled with popcorn. A concession stand, located next to the auction area; offered popcorn, cookies, soft drinks, and candy at prices under a dollar. "It's a family event," said Fire Chief Jay Tappan. "We try and keep our prices low so that all families can enjoy themselves." The donkeys were led out into the gymnasium; the animals wore rubber booties and amused expressions. Our Community game consisted of two teams, the Police on one side and the Fire Department on another. "Guns verse Hoses" chuckled Chief Tappan. "The police beat us last year because they had a ringer. One of the ladies on the Police force used to play semi pro. I think that we'll do better this year." Chief Tappan said "I want everyone to know that the money that we get from our proceeds will go to Student College Scholarships, Food for poor families and toys for needy children. We use our money to finance events that help our children and improve our community." The rules of the game were simple. Riders sit on a donkey and pass the ball to each other. No one dribbles, and you must be astride a donkey when you shoot. I watched our game begin, several animals walked in different directions while others remained stationary. Balls were passed and both sides made baskets. Several of the donkeys seemed to be enjoying themselves and the crowd applauded them. Finally at half time, children were encouraged to come down and pet the donkeys. Some of the animals lowered their heads to allow kids to scratch them behind their ears. "Oh, he feels so soft" said a little girl. The donkeys seemed to enjoy the attention that the children were giving them. All of the animals seemed well behaved and it appeared to me that these donkeys were more pets than working animals. People that ride the donkeys have to sign a waver. They also are not allowed to hit, kick or pull on the donkey's ears, hair or tails. I had the opportunity to have a telephone conversation with Bruce Wick, President of Donkey Sports Inc. His company supplies most of the donkeys for these fund raising events. He told me that some animal rights groups, like PETA, are opposed to Donkey Basketball. He said, "PETA and other groups have accused us of abusing animals. Our donkeys like people and are used to loud sounds. They all love people petting them. Our animals are handled so much that they really look forward to public events." "I looked at all of PETA's concerns," continued Wick, " and the only complaint that they might have is weight. We now make sure that no one weighing over 200 pounds is allowed to ride our animals. If all the things that PETA said about Donkey Basketball were true, we would be against it as well. My wife and I have been in this business since 1980. We have never had a donkey injured in a game or become sick from traveling. When a donkey becomes a good player, they have a long career in donkey basketball. They don't breakdown at a young age or become sour on playing." "I know," said Wick, "it's my hope that donkey basketball is viewed as a wholesome family event, giving young spectators a chance to see and pet real donkeys. Through the years, we have raised hundreds of thousands of dollars for good causes. I would hate to see misinformed people deprive communities from enjoying this wholesome fund raising event." 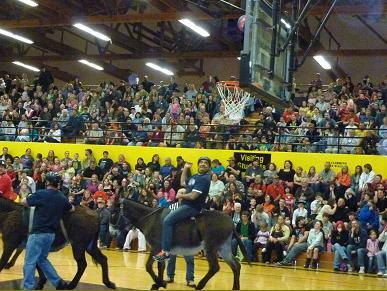 As a member of our St Helens Community, I know that Donkey Basketball has been a fun fund Raiser for us. We have gained from it, our community has gained for it, and believe it or not, I think that the donkeys have benefited from it as well.